First Line: I may be excused for presuming that my name is already known to you, given the not-inconsiderable publicity that my chronicles of the adventures of my distinguished friend Sherlock Holmes have attracted over the past several years through the good offices of your own Guild. Sherlock Holmes has supposedly died at Reichenbach Falls, and Dr. Watson misses his friend. When Watson receives a cryptic note and a ticket for passage to Yokohama, Japan, he finds himself dealing with shipboard murder-- and the astounding knowledge that his friend is still alive. Teamed once again with the indestructible Holmes, the two men fight Professor Moriarty's latest plot. Russia, Egypt, India, Cambodia, China, Japan-- it's a long journey, and Holmes and Watson must remain ever vigilant if they are to stay alive to thwart the professor. 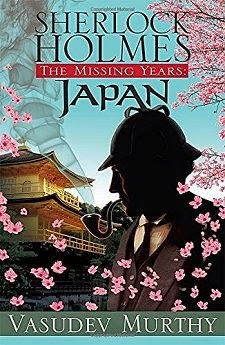 This first book in the Sherlock Holmes, The Missing Years series is filled with exotic locales, a well-drawn cast of characters, and a running joke about Watson's new editor. Murthy proves adept at capturing the voices of his different characters, in particular Holmes, Watson, and a female agent in Japan, as Watson includes other characters' "reports" into his narrative. I also thought that it was genuinely fun to see how those two men manage to stay out of Moriarty's clutches. Vasudev Murthy has written a book sure to please readers who love all things Sherlock, and I'm looking forward to seeing where the next adventure takes me. Cathy - I am always so wary of add-on series like this. Not of course that they can't be good, but I admit I'm a bit of a cranky purist about such things. Still, I'm glad you liked this one. There's absolutely nothing wrong with being a cranky purist, Margot! I've tried to read other modern takes on Sherlock Holmes, but most of the time, I'm never happy with them. I've found that a lot of authors have a hard time writing the character, and they either change his personality, or he becomes a caricature. I'm willing to keep trying though, so I may give this one a go. There's just something about Holmes that makes us keep trying, isn't there, Ryan?